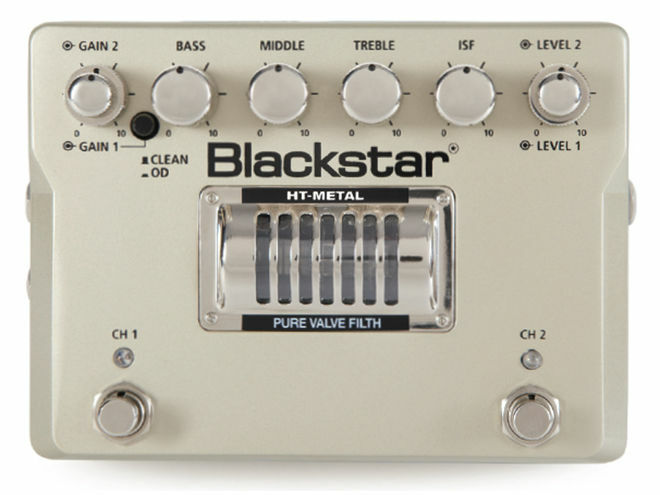 HT-Metal, Other guitar saturation effect from Blackstar Amplification in the HT Pedals series. Blackstar has unveiled a new all-valve pedal aimed at high-gain metal players. 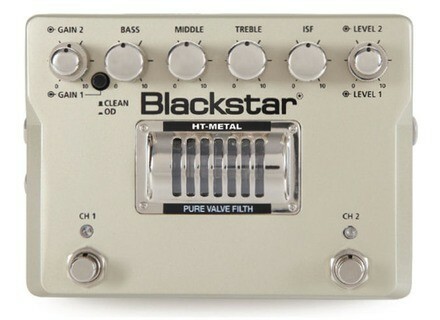 Blackstar's new HT-Metal valve pedal is described as a "no-compromise, two channel, ultra high gain, filth machine." As with other pedals in the series (HT-Boost, HT-Drive, HT-Dist, HT-Distx and HT-Dual), the HT-Metal is powered by a 300 Volt H.T. valve circuit. The two cascaded ECC83 triode stages are designed to give more extreme gain and each ultra-high gain channel has its own gain and volume controls. Channel 1 is also equipped with a Clean/Overdrive switch so the pedal can be used for clean, overdrive, or high gain. The three-band EQ (Bass, Middle, Treble) includes Blackstar's ISF (Infinite Shape Feature) control, which is designed to re-voice the entire tone stack from British Heavy Metal to US High Gain. Housed in a metal case, the HT-Metal features a buffered bypass for silent switching. There are two outputs. The first is designed to connect to an amplifier or to the guitarist's other pedals. The second is a new benchmark design, speaker emulated output allowing the guitarist to get valve (tube) tones to disk or tape. Check out Blackstar for more details.